Despite it being something that most of us use every day, the details printed on the banknotes and coins in our pockets, wallets and purses often go completely unnoticed. Although most people only briefly glance at their money when they are counting it or using it in a transaction, the many different currencies from around the world contain intrinsic designs and surprising amounts of detail. While it’s true that most of these features are chosen to prevent counterfeiting and are used to deter potential fraudsters from being able to duplicate notes or coins, even the earliest patterns and designs printed or engraved on currency were chosen to reflect the heritage, history and culture of a country or nation. The currency of the United States has always enjoyed a particular level of intrigue since the first one-dollar bill was issued in 1862. American dollar bills have a fascinating history and contain some surprising details and hidden facts. Although some of these ‘secrets’ have been misconstrued over the years and venture too far into conspiracy theory territory to be considered truly credible, there are some fascinating details behind America’s dollar bills. Interestingly, one of the most popular misconceptions about the currency of the United States is the fact that there is a legitimate form of dollar bill which many people mistakenly think is fake. The two-dollar bill was introduced in 1862 along with other forms of dollar banknotes. Dollar bills were originally called ‘United States Notes’ when they were first issued but these were gradually discontinued until they were completely replaced by the ‘Federal Reserve Note’ in 1971 (United States Notes are still legal tender but they are very rare and few are in circulation). Two dollar-bills were underused so the government stopped printing them in 1966 when the discontinuation of United States Notes began. They were brought back a decade late but because denominations are printed according to demand very few are in active circulation. Many people keep the notes thinking that they are rare and will be worth more money one day or because they think that they will not be able to spend them (there are countless anecdotes and stories about businesses refusing the bills as legal tender). Some people think that they are lucky and keep them for a special lottery ticket purchase while others think that they bring bad luck and try to get rid of them as soon as possible. Whatever the reason is for the low circulation of two-dollar bills, the only chance the denomination has at being more widespread is if more people start using them. Unfortunately, it doesn’t seem as if that will happen any time soon. The argument for the separation of church and state has been ongoing in the United States for many years. 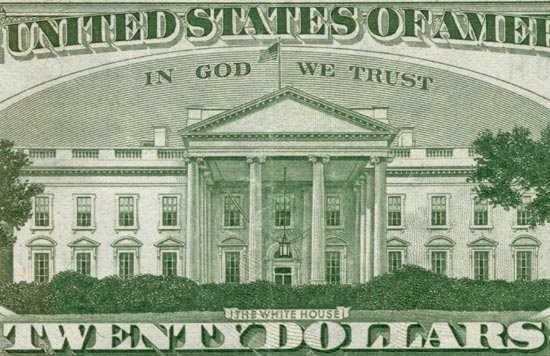 One of the major points of contention for many secularists is the fact that ‘In God We Trust’ is printed on dollar bills. Interestingly, this wasn’t always the case. While the phrase has been printed on coins since the Civil War in 1864, it was not added to banknotes until 1963. This was after the phrase became the official motto of the United States in 1956 (replacing ‘E Pluribus Unum’ which translates to “Out of many, one”) when Cold War tension was at its peak. The United States wanted to distinguish itself from the state atheism of the Soviet Union so it affirmed it’s religious beliefs through a new motto, and it wasn’t long before its currency followed suit. Founded sometime in the 17th century, the Freemasons are a secretive fraternity composed almost entirely of rich and powerful men. Although it insists it is a modern, progressive organisation, Freemasons have always been seen as an ‘elite’ bunch. They have been accused of everything from influencing political opinion to even plotting the French Revolution, but Freemasons insist that they are nothing more than a club (albeit one that doesn’t have a very open-door policy). There is a theory that the Freemasons had some sort of influence in the design of the dollar bill and even in the founding of the United States. 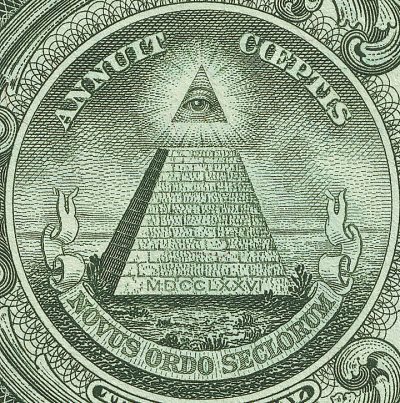 The Eye of Providence which sits atop the pyramid on the Great Seal of the one-dollar bill is a motif often used by the Freemasons. Also, Benjamin Franklin, who was involved in the design committee of the dollar bills, was a confirmed Mason. However, not only has this symbolism been used by different cultures and religions for thousands of years (one of the earliest examples is the Eye of Horus from ancient Egypt), the Freemasons didn’t adopt the Eye of Providence as one of their symbols until after the Great Seal was designed. Also, none of Benjamin Franklin’s ideas for the Great Seal were approved. It’s easy to see why there are so many conspiracy theories surrounding the one-dollar bill. While other banknotes have rather simple buildings on the their reverse sides (the ten-dollar bill has the U.S. Treasury, the five-dollar bill has the Lincoln Memorial, the twenty-dollar bill has the White House and the fifty-dollar bill the Capitol), the one-dollar bill has a much busier and more ornate design on it’s reverse. Featuring The Great Seal, Latin phrases, a coat of arms and an elaborate lattice pattern framing the bill, the one-dollar note has been examined from top to bottom in search for any hidden meanings which would otherwise be overlooked. 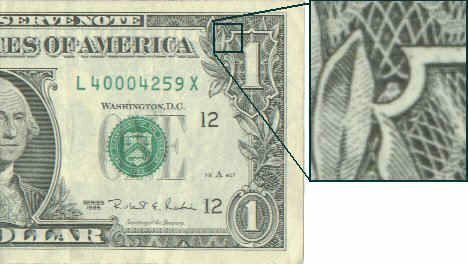 One of the most curious of these supposed secrets is that there is a tiny owl in the top left corner of the ‘1’ on the right side of the bill and there are two small spiders on the bottom frame. Many people have theorised that these have been deliberately inserted into the design and connected the imagery of owls and spiders with Freemasons, the Illuminati and even Satanism. Sadly, the truth is much more boring. They are simply the result of peaks in the lattice design. The same peaks can be seen in other parts of the lattice pattern on the bill but these just happen to stand out and look like something they’re not. Despite their texture and the fact they are commonly referred to as ‘paper money’, dollar bills are actually made from a unique cloth blend. While most ordinary paper is made from wood fiber, dollar notes are made from a blend of cotton fiber paper which is around 70% cotton and 30% linen. This gives the notes a much thicker and more durable feel and makes them longer-lasting. The cloth is very difficult for counterfeiters to reproduce and anyone who handles money on a regular basis can instantly tell if a bill lacks the unique texture of an authentic banknote. The special paper also has red and blue fibers woven into the bill itself. This is another particularly difficult feature for counterfeiters to reproduce as the fibers are embedded in the bill and not just printed on the surface. Most consumers probably find it difficult to find somewhere that accepts a $100 dollar bill without raising a fuss, but there are much higher denominations of dollar bills which are technically still legal tender. Although they are very rarely seen today outside of private collections and even some museums, $500, $1,000, $5,000 and $10,000 dollar bills were all in circulation at one point in time. Remarkably, there were even $100,000 gold certificate bills printed during a three week period in December 1934 and January 1935. However, these were specially designed for official government transactions between Federal Reserve Banks (many of the other larger denominations were also only used for large financial transactions in banks). After World War II, the production of these larger denominations were halted by the Treasury and an executive order passed by Richard Nixon in 1969 required that they be taken out of circulation. Some suspected that the reason for this was to make it much harder for organised crime syndicates to handle and transfer large sums of money, but it’s more likely that the notes were gradually phased out by the Federal Reserve simply because very few people really needed to use them. The huge rise in electronic banking means it is unlikely that these types of higher denomination bills will ever be produced again so they are very sought after items in the collector’s market. In fact, there are so few of these notes out there (only 342 $5,000 bills and 165,372 $1,000 dollar bills are known to exist) that collectors have paid well above face value to get their hands on pristine or older printings of the notes. The Illuminati is one of the most infamous groups discussed by conspiracy theorists. Founded in Bavaria in 1776, the ‘original’ Illuminati opposed religious influence in everyday life and wanted an end to the abuse of state power. The group was outlawed and disbanded less than a decade later but many think that the secret society never truly went away and only continued to grow in power. Some believe that the Illuminati is behind many of the biggest events in world history and that they continue to control the flow of world affairs with their considerable political and corporate influence. Of course, this idea of a secretive elite fighting toward a New World Order is nothing new, but many dedicated conspiracy theorists look for much older clues to the Illuminati’s intentions and past actions. The one-dollar bill is often used as apparent evidence to prove that the Illuminati was instrumental in the founding of the United States. Like the Masonic connection, the Eye of Providence is widely thought to be an Illuminati symbol which represents an all-seeing, all-knowing power. 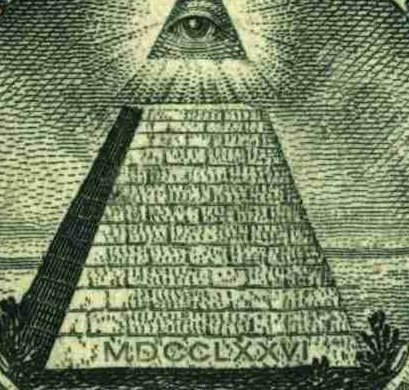 It has also been argued that the pyramid on the one-dollar bill represents a power structure where the Illuminati sits at the top (the recurring use of pyramids in financial and corporate logos is also used as ‘evidence’ for the powerful far-reaching nature of the society) and that the MDCCLXXVI (1776) printed on the base of the structure is not a reference to the year when the United States declared its Independence but is instead a reference to the year the Illuminati was founded. Of course, like most conspiracy theories (such as the supposed Freemason connection) most of these coincidences are not any form of actual proof or evidence and it seems very unlikely that the Illuminati has any connection to the design of the one-dollar bill.. The number thirteen seems to be of great significance in the design of the one-dollar bill. The pyramid has 13 steps, there are 13 stars above the eagle, there are 13 horizontal and vertical stripes on the shield, there are 13 letters in Annuit Coeptis and E Pluribus Unum, the olive branch clutched in the eagle’s left talon has 13 leaves and 13 berries and the right talon holds 13 arrows. The repeated examples of 13 surely can’t be a coincidence, but what could the hidden meaning be? Of course, 13 is a very superstitious number and is considered to be unlucky in many different cultures (including the United States). The number also has significance in many different religions including Christianity (13 people were at the Last Supper, the feast of Saint Anthony of Padua falls on June 13th and takes place over thirteen weeks), Judaism (13 is the age a boy has his Bar Mitzvah, there are 13 principles of Jewish faith) and Islam (Ali, the cousin of Muhammad, was born on the 13th day). There are countless other examples of 13 being significant or important, but the explanation for its appearances on the one-dollar bill is in fact relatively simple. There were 13 colonies that declared their independence from Great Britain in 1776 and joined together to become the United States. With the exception of the ten-dollar bill, each denomination of the United States currency has a different presidential portrait printed on the front (Alexander Hamilton is on the ten-dollar bill and although he was never President he was one of the founding fathers and the first Secretary of the Treasury). However, between 1878 and 1964 the United States also produced silver certificate banknotes. These were issued in response to the Coinage Act of 1873 which put the United States on the gold standard. At risk of completely demonetizing silver because it was no longer being used in coinage (and therefore angering mining states who would suffer from the devaluation of the precious metal), the Treasury agreed to buy between $2 and $4 million of silver bullion each month at a cost greater than the market value in an effort to instil confidence in the metal (of course, gold was still worth much more). Silver certificates were banknotes which were redeemable for between $1 and $1,000 worth of silver coins or bullion. To distinguish between normal dollar bills, silver certificates had very different designs which did not always feature presidential portraits. The very first set of silver certificates printed in 1886 featured Martha Washington, George Washington’s wife. To this day, Martha Washington is still the only women to have been printed on any denomination of United States currency. Following the surprise attack on Pearl Harbor by the Japanese Navy in 1941,the United States military grew increasingly anxious about the possibility of an invasion of Hawaii. If this had happened, the Japanese would have had access to a significant amount of foreign currency which they could have strategically seized and used for their own purposes. In response to this possibility, the United States recalled as much currency as possible from individuals and businesses in Hawaii and issued the production of the The Hawaii Overprint Note. This was an emergency form of currency which was only issued to Hawaii. ‘HAWAII’ was printed quite prominently on each banknote so they could easily be identified, but the notes could still be spent like any other dollar bill in Hawaii or in the rest of the United States. However, if Hawaii was lost to the Japanese, the Treasury could simply declare the notes worthless and refuse them as legal tender. Thankfully for the United States, the government did not have to enact its contingency plan and the notes were recalled after the war and gradually brought out of circulation. #2: Ben Franklin is on the $100 bill and was never president…. No, but a founding father. A major figure.